Apple's new smart speakers can discolour wooden surfaces, leaving a white mark where they are placed, the firm has acknowledged. The US company has suggested that owners may have to re-oil furniture if the HomePod is moved. The device went on sale last week after having been delayed from its original 2017 release date. Apple updated its help page to suggest "placing your HomePod on a different surface" if customers were concerned. "It is not unusual for any speaker with a vibration-dampening silicone base to leave mild marks when placed on some wooden surfaces," the company said. "The marks can be caused by oils diffusing between the silicone base and the table surface, and will often go away after several days when the speaker is removed from the wooden surface. "If not, wiping the surface gently with a soft damp or dry cloth may remove the marks. If marks persist, clean the surface with the furniture manufacturer's recommended cleaning process." 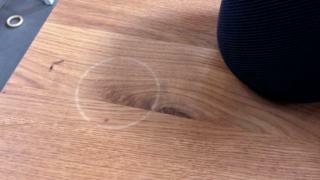 The website's founder, Stuart Miles, told the BBC that a speaker left a mark on his kitchen worktop within 20 minutes. "To clear it, I had to sand the wood down and then re-oil it," Mr Miles said. "It wasn't the end of the world for us. But if you've bought an expensive Scandinavian sideboard or some beautiful piece of wooden furniture and then got a mark on it from the speaker, you can imagine the horror," he added. The NYT's Wirecutter site said Apple told it that "the marks can improve over several days after the speaker is removed from the wood surface." Apple added that if the marks did not improve then customers could "try cleaning the surface with the manufacturer's suggested oiling method". It is not yet clear if the problem affects all HomePod speakers or just a sample of the initial production run. The £319 HomePod has been praised in reviews for the quality of the bass notes that it can produce. But to do so, it needs to be placed on a flat surface. "Most others devices that I test have small feet that raise them off the counter ever so slightly to cause an air flow," commented Mr Miles. "But the HomePod appears to need contact with the surface that it's on to resonate and create the powerful bass. "I put it on a coaster to see if that would combat [leaving a mark] but that destroyed the bass qualities, so that's not a fix to the problem," he added. According to one furniture polish advice site, the most common causes of white marks on wooden furniture are heat and moisture. The BBC has asked Apple for more details about the issue. One blogger who closely follows the company was surprised by the development. "Anyone who runs into this should be outraged," wrote Daring Fireball's John Gruber. "Apple has been making products that go on shelves and tables for years... and I've never seen a report of damage to a surface. "This seems like an issue that should have been caught during the period where HomePod was being widely tested at home by many Apple employees."